After 2 long months, i m participating in BM, i will be doing all 4 weeks this month. For week 1 i chose the theme Toast for Dinner. To say the truth, we eat toast for breakfast, rarely for dinner. So, when i chose the theme, i had to make toast for dinner, and the first recipe i decided to make is, this avocado toast. I don't buy avocado often, very rarely just for milkshakes, so when i decided to make the toast i bought 3 about to ripe avocados, and waited for almost 4 days for it to ripen. Waiting for the avocados to ripen is such a pain, if you miss it, it will end up in the trash. The pain of throwing a costly fruit almost kills me. But thankfully, i was able to use up all the fruits i bought this time. The fun part is mashing the gWe totally loved the toast, feel free to add or delete the seasoning as per your taste. 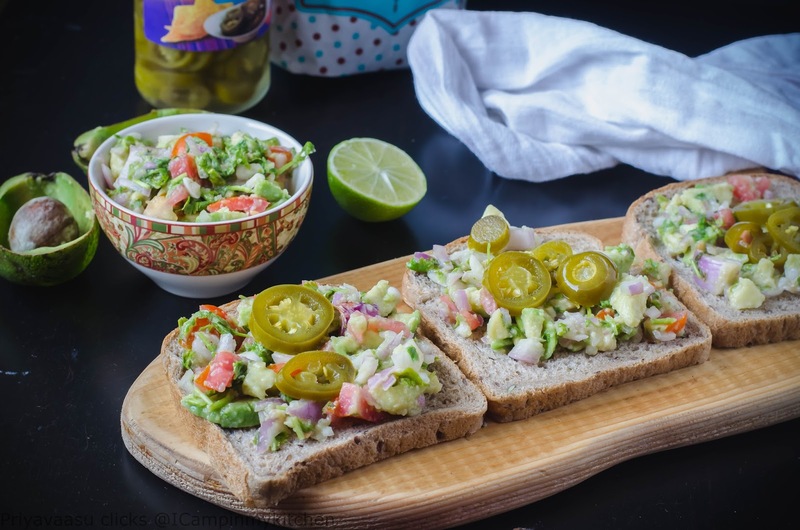 I have used sliced jalapeno peppers(brined) to add zing to the toast and i absolutely relish it! Cut the avocado, scoop out the flesh into a bowl. To this add chopped onions, tomatoes, coriander leaves, juice of lime. Using a fork, mix and mash it well. Do not make it a paste, but a chunky dip. To this add salt and pepper according to your taste. 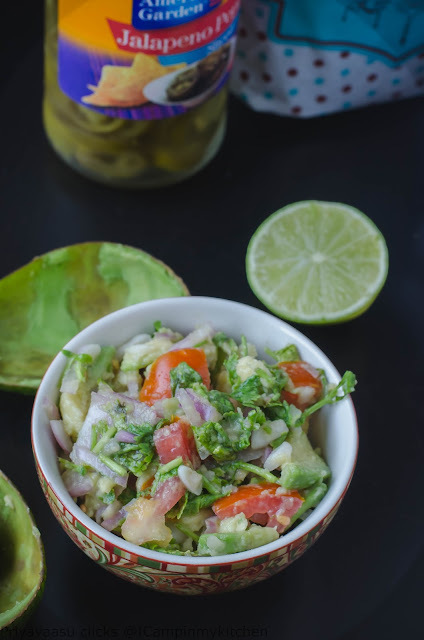 Place 2-3 tbsp of guacamole on a bread slice, place the bread slice on a hot tava, keep the flame simmer, so that the toast cooks slow and turns brown and crisp. It takes around 2-3 minutes for the bread turn crisp. Serve hot straight from the tava and enjoy. Very innovative use of guacamole. Love the pictures. Such a delicious toast with avocado. Whenever I buy, I usually slice it when it is still raw and bitter or when it is super ripe and goes waste. That is why I always keep away from buying avocados. Wow this way we will all eat avocado. Generally its me dithering what to make that make me bin it. Nice toast priya. Yes, waiting to use up the avacado is such a pain and through it away because it is too late is wasteful. I rarely buy it. 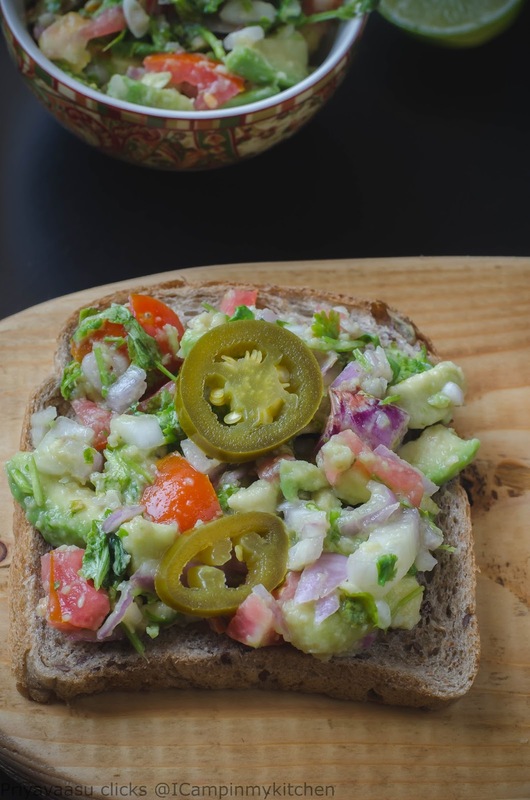 Thats seriously a brilliant idea of making toast with this chunky guacamole, very droolworthy toast. Looks soo delicious. Avocado have become our family favorite these day, they are soo good. Lovely share.. always love avocado in toast!! I am a big fan of avocado. But agree with you about that thin line between ripening and over ripe. I add it to all kind of salads and toasts too. 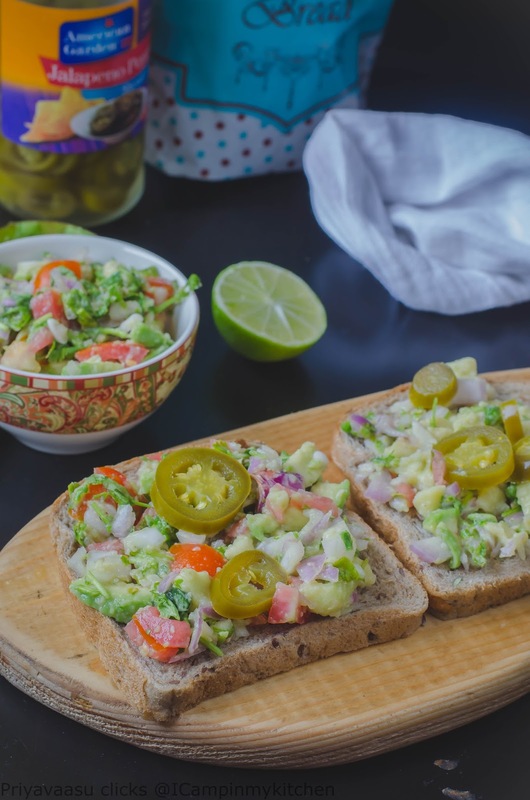 Avocado toast is the latest trend and I love your version with onions and jalapenos. Looks hearty to serve for dinner. Very filling and inviting looking toasty. Love avocados in all forms.